Translucent braided reinforced silicone hose available in medical and food grades, size range 3 to 25mm. FDA (Food and Drug Administration in the US) approved. We can even make these products to your specifications. High quality silicone tubing available in industrial, food, medical or peristatic pump grades. Available in translucent-colours made to order. We can even make products to your specifications. We have a huge range available. Temperature range -50°C to +350°C. We can even make these to your specifications. We have a huge range available. We can even make these to your specifications. A thermal performance that is unmatched by most organic elastomers. The weathering properties of silicone Elastomers lends itself ideally to outdoor applications such as Door Seals, Glazing Seals, ‘O’ Rings, and so on. Silicone repells water. Silicone is little effected by heat or climatic conditions. Dialectic properties are excellent and little altered by heat or humidity. Silicones are non-toxic and allow our products to be used in the cosmetics, dental products, pharmaceutical and food processing industries. 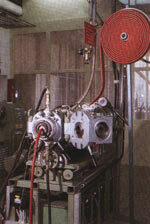 We offer a comprehensive range of quality hoses and tube products for a variety of uses. If you cannot see what you are looking for here, it is likely that we do stock it so it is worth contacting us and telling us what you need.